Over their full lifetime, a compact fluorescent light bulb will consume 3.9 times less energy than an incandescent bulb. Although CFL's contain mercury themselves, their actual operation will introduce less mercury into the atmosphere than incandescent bulbs due to the fact that coal power plants spew out mercury. If your CFL bulb lasts longer than 50 hrs, then they will indeed save energy over their entire lifecycle. CFL's, like many technologies, are ultimately only a stepping stone towards better, currently more expensive things, such as LED lighting, which promises to be even more efficient than CFLs. Note: If you don't want to read all of this, here is the key point. If a CFL bulb lasts for longer than 50hrs, then the total life cycle energy consumption of the CFL will be lower than that of an incandescent bulb even though they are more complicated to make. According to the U.S. Department of Energy, lighting in the U.S. accounts for 22% of electricity consumption and costs American's $58 billion a year. If every American home replaced just one light bulb with a compact fluorescent light bulb (your everyday energy "efficient" bulb), we would save $600 million per year in energy costs and prevent greenhouse gas emissions equivalent to 800,000 cars. These numbers account for the life of the bulb though, not the entire life cycle of the bulb. The question of whether we can be more lighting efficient by using compact fluorescent bulbs needs an in depth analysis of how much energy is required to make and recycle the bulb. It's actually quite complex. Here's why. When evaluating energy consumption or CO2 emissions of a technology, the full lifecycle of the product should be considered, not just its lifetime productivity. A proper analysis should include the CO2 emissions or embodied energy associated with all of the raw materials, all of the transportation and distribution, the operation and finally the recycling or decommissioning of the product. You'll find a couple different names for this type of assessment popping up: energy return on energy invested (EROI), well-to-wheel (these two are typically used for fuels), dust-to-dust, cradle-to-grave or more correctly, life cycle analysis (LCA). The LCA is what really matters when talking about energy consmption/CO2 emissions. You're probably familiar with the mother of all LCA debates: ethanol - does it produce more CO2 than gasoline over its lifetime, doesn't it? It's a hugely important question since the wrong policy decisions are being made right now by politicians who just don't know. In the same sense as the ethanol lifecycle, you wouldn't think about oil from Alberta's oil sands without thinking about natural gas, water or strip mining, or about coal power without thinking mountain top removal. So why is it that we only think about the lifetime of an energy efficient light bulb (in this article, a compact fluorescent light bulb, CFL) and not its dust-to-dust lifecycle? It's likely because we're really only interested in our bottom line - the fact that energy efficient light bulbs use 13W instead of 60W, which could save us money. That, and because accounting for the total life cycle is notoriously difficult. Keeping in mind the time requirements and expertise required to do a lifecycle analysis, I'm in no position to do one myself (and very few are), but luckily, I've found people who are. A picture of my prematurely broken CFL bulb. Every CFL has one of these microchips (balasts). This one contains 24 components. Compare this to an incandescent bulb with a tungsten filament, is simple more beautiful? The lifetime of the compact fluorescent light bulb is where it really shines compared to the incandescent. An incandescent light bulb heats the tungsten filament by passing a current through it. This process sees 90-95% of the energy input going to heat and 5-10% going to light. In contrast, the CFL operates in a completely different way. Electricity is passed between two filament cathodes which stimulates mercury atoms to radiate ultraviolet radiation and heat. The UV radiation is transformed into light via the phosphor coating on the tube. With this process, about 25% of the energy input goes towards making light and 75% goes to heat. When your CFL dies, it's not recommended that you throw it out, this'll just increase the chances of the mercury getting out into the open. The mercury can be recycled or disposed of properly and there are specific CFL recycling programs in place. For incandescent, no guide lines, just throw it in the trash. Bulb for bulb, the energy "efficient" kind requires 5.7 times more energy to make than the incandescent bulbs, BUT, they last 8 times longer (1000hrs lifetime for incandescent bulbs vs 8000hrs lifetime for a CFL). So for every 1 compact fluorescent bulb that is made, 8 incandescent bulbs are made. Advantage CFL. During the operation phase, the CFL needs 120kWh over its lifetime, whereas 1 incandescent bulb needs 60kWh or 480kWh for 8 incandescent bulbs. Advantage CFL. The study that I cited above neglects the recycling stage, so I assumed here that it takes as much energy to recycle a CFL bulb as it takes to produce, 1.7kWh whereas an incandescent bulb is simply thrown out, and I assign 0kWh to the recycling stage of the incandescent. Advantage incandescent. Although CFL bulbs are supposed to last 8 times longer than the typical incandescent bulb, more often than not (at least in my experience), they seem to burn out prematurely. Given that they take more energy to make, bulb-for-bulb, this got me thinking. 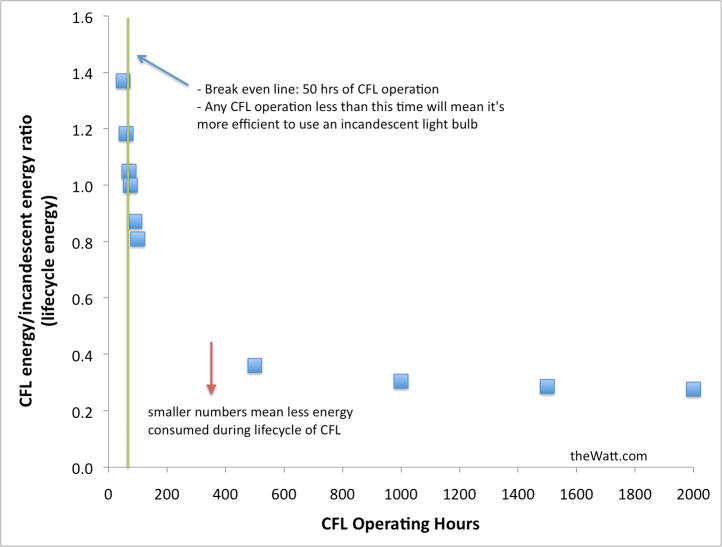 How long does a CFL bulb need to be running for until it breaks even (energy wise) compared to an incandescent light bulb? The answer's in the graph below - 50hrs. Break even point (energy wise) for a CFL bulb compared to an incandescent bulb. If the CFL bulb operates for 50hrs or more, then it will produce energy savings compared to the incandescent bulb. Ever since I tore apart my old CFL bulb to find the microchip inside, I have been unconvinced that these bulbs provided any energy savings at all. Now I know that they do. Over their full lifetime, a compact fluorescent light bulb will consume 3.9 times less energy than an incandescent bulb. Although CFL's contain mercury themselves, their actual operation will introduce less mercury into the atmosphere than incandescent bulbs due to the fact that coal power plants spew out mercury. If your CFL bulb lasts longer than 50hrs, then they will indeed save energy over their entire lifecycle. CFL's, like many technologies, are ultimately only a stepping stone towards better, currently more expensive things, such as LED lighting, which promises to be even more efficient than CFLs.